Have you ever wondered how vendors in the wedding industry grow, learn and flex their creative muscles, especially when they are already so busy?! One of the biggest ways small business owners grow is by collaborating with others to create something unique and inspiring while trying to market their specialties and getting the opportunity to work with others to create a growing community. Being newer to the wedding industry, I decided I needed to learn a little more from others who have experience longer than I have. I felt it was so important to gain certain knowledge from seasoned creatives so I could then implement it into my own work and create a unique experience for my own clients. 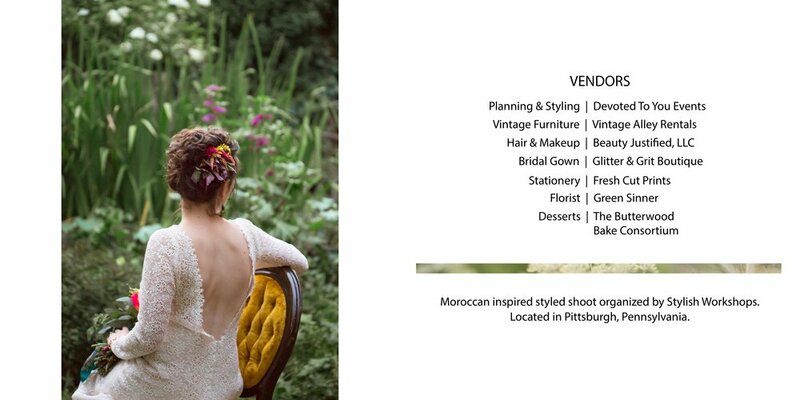 A year ago, I attended Stylish Workshops Moroccan inspired styled workshop in Pittsburgh, PA, where they teach you the importance of creating your own ideas and sharing your work in the industry. We went over how to set up a styled shoot, what to focus on and how to potentially be featured on other blogs which helps with your marketing growth. But most importantly, we learned that we needed to "find your tribe". This was a big take away for me because this is an industry where collaboration is key and when you find the people and businesses you can connect with on a great level, it will be an experience that is benefited by all who are involved. I was really nervous going into this because these vendors have been in the industry for so long and I looked up to their growth & knowledge of it all. After all said and done, it was the best experience I could have put myself in to jump start my career in the wedding industry. I now have met so many other vendors who I have become great friends with and truly believe in the mantra 'community over competition'. So although we continue to be busy serving our clients our best highest quality, we are continually trying to grow ourselves and are called to be creative. These small little styled shoots help so much in creating inspiration and motivation to keep going for ourselves and you! So if you see a lot of vendors doing styled shoots, know that a lot of heart and soul went in to it to show you just how awesome we are when we work together & collaborate. And while we do it for ourselves, we also do it for you and hope that you may see something that pulls at your heart strings! And quite possibly may be inspired to implement it into your wedding day, too. 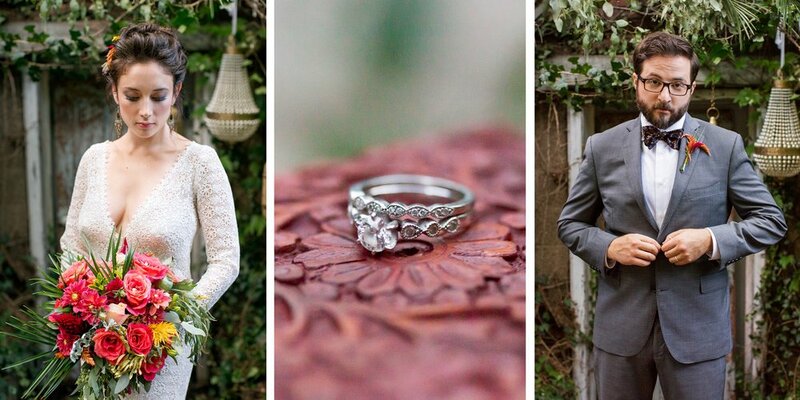 I hope you enjoy this Moroccan inspired styled shoot from my own eyes. It is colorful, eclectic and oh so romantic! 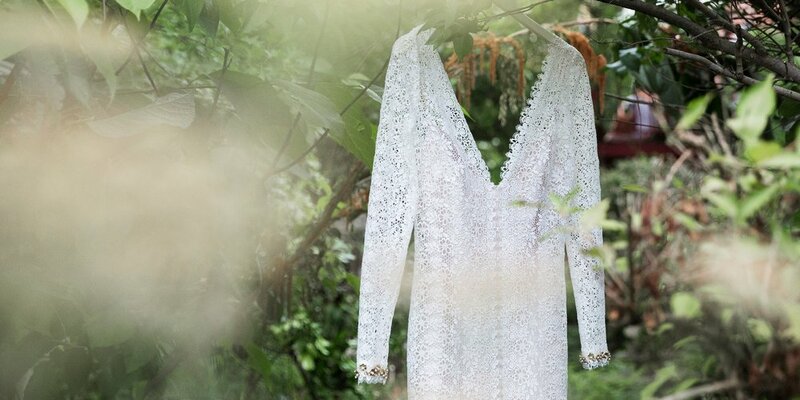 I'm still dreaming about that lace dress & those beautiful flowers.